This is my character sheet, or design specification, for Abram/Abraham. 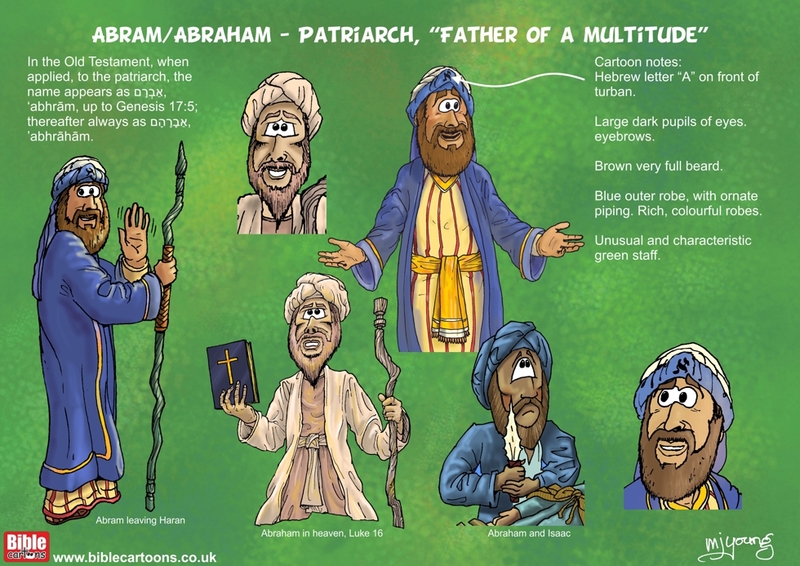 The purpose of this sheet is to keep a record of the attributes or characteristics of my drawing, so that I can draw a similar-looking cartoon in all future scenes showing Abram/Abraham. I first drew my version of Abram/Abraham in July 2009, with the scene “Genesis 22 – Abraham and Isaac – Scene 03 – Sacrifice (Version 01)”. Although my style has changed a bit since those early cartoons, I try to maintain the same facial features, colouring and clothing style, so that the figure is recognizably that of Abram/Abraham, even when months or years have elapsed between drawings. The name Abram means “high father”. Abraham means “father of a multitude”. Abram/Abraham was was born in Ur, of the Chaldeans, in 2161 B.C. He was of the 9th generation from Shem, the son of Noah (Genesis 11). His father’s name was Terah. Abram/Abraham’s life can be divided into four periods, the beginning of each being marked by a divine revelation. The First Period includes the call and Abram/Abraham’s journey to Haran (aged about 70 years), to Canaan, on to Egypt, and back again to Canaan. Abram/Abraham’s nephew Lot departed from him at this point, since the land could not sustain both arms of the family, with all it’s livestock wealth. Lot was captured by a raiding king of Aram (Chedorlaomer (Kedorlaomer, NIV)) and subsequently rescued by Abram/Abraham. Arriving at Salem on their return, they were met by Melchizedek, king of Salem, and “priest of God Most High”. The Second Period includes the promise of a lineal heir (Isaac) and the conclusion of the covenant (Genesis 15-16). Abram/Abraham received a detailed repetition of former promises by God, and by a solemn covenant contracted between them. Even so, Abram/Abraham had lived ten years in Canaan, and still he had no child, despite God’s promise to give him more descendents than stars he could count in the sky. Sarah, now seventy-five years old, followed contemporary customs, allowed Abram/Abraham to take Hagar, her Egyptian handmaid as his wife. She bore him a son, named Ishmael (Genesis 16) in 2075 B.C. The Third Period includes the establishment of the covenant, the change of Abraham’s name, and the appointment of the covenant sign of circumcision (Genesis 17-21). Thirteen more years passed, and Abram/Abraham reached his ninety-ninth year. God appeared to him and changed his name from Abram to Abraham, and Sarai’s name to Sarah, renewed his covenant, and commanded that all the males of his company should receive circumcision. Abraham was then assured that Sarah, then ninety years old, should in a year become the mother of Isaac. Shortly afterwards Abraham sat in his tent, under the oaks of Mamre. Three divine travellers approaching and he offered them hospitality. The promise of Isaac was renewed, and Sarah’s incredulity rebuked! The Lord revealed to Abraham the coming judgment upon Sodom and Gomorrah, followed by Abraham’s pleading on behalf of the cities (Genesis 18). When Abraham was one hundred years old, and Sarah ninety, the long-promised heir Isaac was born, in 2061 B.C. The Fourth Period includes the test of Abraham’s faith (God asking him to sacrifice his son Isaac) and his final years. When Isaac was nearly grown, God subjected Abraham to a trial of his faith and obedience. In 2036 B.C. God directed Abraham to take his son to Mt. Moriah and sacrifice him there. A ram was divinely provided as a substitute for Isaac at the last minute, once Abraham had proven that he would not withhold anything, including his own son Isaac, from the Lord. Sarah dies at age 127 years, near Hebron. Abraham purchased from Ephron the Hittite the cave of Machpelah, the field in which it stood, and all the trees in the field, and there he buried Sarah (Genesis 23). Rebekah, the daughter of Bethuel son of Nahor was chosen to be Isaac’s wife (Genesis 24). Some time after Abraham took another wife, Keturah, by whom he had several children. Abraham died when he was 175 years old and was buried by Isaac and Ishmael in the cave of Machpelah (Genesis 25), in 1986 B.C.